Author: Peterson, Joan Set In . . . 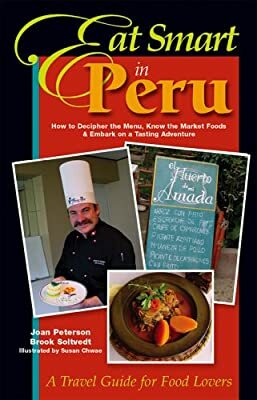 This smartly designed, and richly photographed and illustrated culinary travel guidebook tells travelers how to find the most delicious, authentic, and adventuresome eating experiences in Peru. The authors share the secrets they’ve uncovered while hunting for something good to eat—from restaurant dining to home cooking to fresh market produce to street-vendor fare—to allow you to get to the heart of the culture through its cuisine. Food is one of the first and most immediate contacts a traveler makes with a foreign county. Travelers to Peru can make it a more memorable contact by taking along the easy-to-use Eat Smart in Peru, the newest guide in the award-winning EAT SMART series. The authors show that traveling and eating in unfamiliar territory doesn’t have to be gastronomical guesswork.